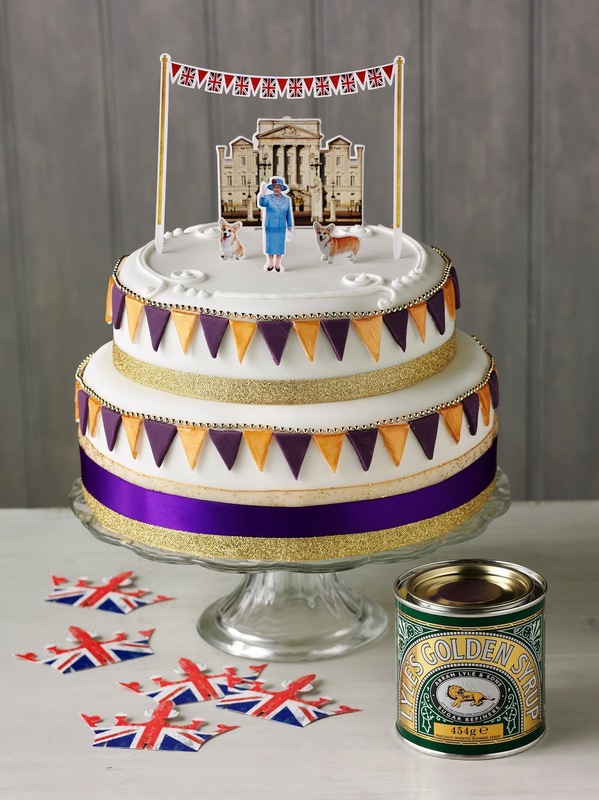 Her Majesty’s Birthday Cake: Celebrate Her Majesty The Queen’s 90th Birthday with a right royal birthday cake knees up! Grease two 23cm sandwich tins and one 15cm cake tin with a little butter or vegetable oil. Line the bases of the sandwich tins and the base and sides of the cake tin with non-stick baking paper or greaseproof paper. In a large mixing bowl, beat the butter until soft and creamy, then add the caster sugar and beat well with a wooden spoon or hand-held electric mixer until light and fluffy. Add the Lyle’s Golden Syrup and beat well. Gradually add the eggs, beating well between each addition. Stir in the vanilla extract. Sift in the flour and salt, then use a large metal spoon to fold it in gently. Do not beat, or you will lose the air. Add the milk and stir in gently to form a soft, dropping consistency. Share the mixture between the prepared tins, leveling the tops. Bake the sandwich tins for about 25-30 minutes and the cake for 35-40 minutes, when the tops should be firm yet slightly springy. (You may have to do this in separate batches). To test that the cakes are done, insert a fine skewer into the centre – it should come out clean. Cool the cakes on a rack for 5 minutes, then turn out and carefully remove the lining paper. Leave until completely cold. For the frosting, beat the butter until soft and creamy, then gradually add the icing sugar, beating well with a wooden spoon or hand-held electric mixer. Beat in the Lyle’s Golden Syrup and vanilla. Reserve 1 tbsp of this butter icing, cover and set aside. Level the top of the 15cm cake, then cut it in half horizontally. Sandwich the two halves together with jam and buttercream. Spread the top of one sandwich cake with jam and buttercream, and position the second sandwich cake on top. You now have two cakes filled with jam and buttercream. Spread butter icing evenly over the tops and sides of both cakes. Leave in a cool place for 2-3 hours. Reserve 100g of white regal icing. Roll out about three-quarters of the remaining white regal icing on a work surface lightly dusted with icing sugar. Use this to cover the 23cm cake, trimming to fit. Roll out the remaining quarter to cover the 15cm cake. Spread the reserved 1 tbsp of butter icing onto the middle of the large cake and position the small cake on top. For the bunting, roll out the purple regal icing and cut into small triangles. Repeat with the reserved white regal icing, then brush these with edible gold paint. Spread out on trays and leave to dry overnight. Next day, make up a stiff icing with the icing sugar and a little cold water. Put it into a small piping bag fitted with a plain nozzle. Attach the purple and gold triangles one by one to create the bunting, piping a little icing onto them to keep them in place. To complete the cake, tie purple and gold ribbon around the tiers, then serve. 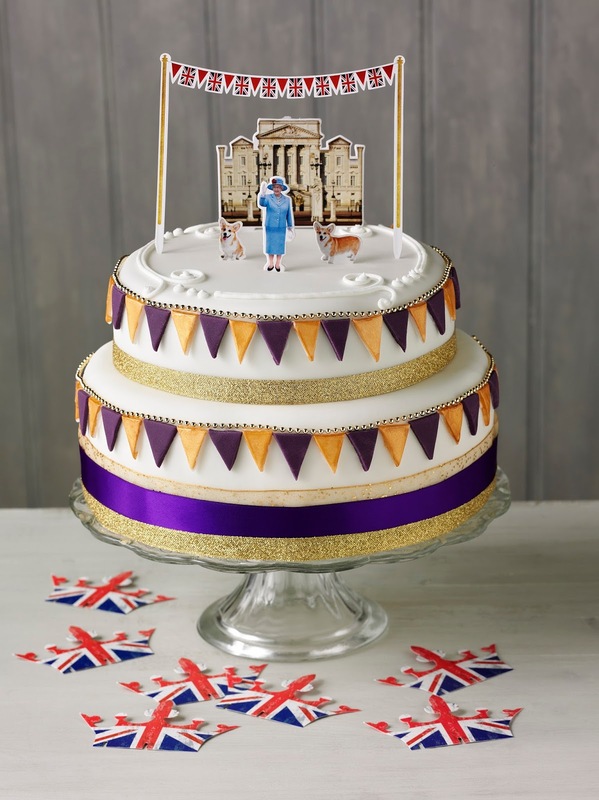 Look out for mini royal decorations to put the finishing touch onto your cake. This recipe is courtesy of Lyle’s Golden Syrup. For more delicious recipe inspiration visit Lyles Golden Syrup. "Upcycled Bottles : Flower Vase .."